Flipping fast food on its head! We serve raw organic vegan SLOW food, fast! A lifestyle that doesn't cost the Earth. Serving organically inspired, locally produced, vegan & raw slow food, fast! At the core of MANA! is a handmade brick oven baking wholesome flatbreads we have dubbed “FLATS”. Wrapped & conveniently served in our signature paper-only Eco- packaging together with a mouthwatering selection of homemade real foods. MANA! introducing a new way of eating healthy wholesome organic fast food on the go. Food & Lifestyle that doesn’t cost the Earth & certainly inspires Change. September 21, 2018 / MANA! We often think, that we seem to be the only ones who care about the state of our Planet & the well fare of its animals & Eco-systems… We wonder why others don’t seem to notice the injustice & the madness of our societal ways… Or don’t even seem to care! We wonder why mainstream media doesn’t report the truth of what on Earth is going on…!? We despair at how there can be such a lack of awareness about things that really & truly matter to everyone, such as our Oceans, our soils, our forests, the air we breathe & the foundations of Life that belong to everyone & no one….!? Yet, in spite of all of this pain & frustration that we can feel…, there is hope! In fact there is a lot of hope & lots of good news too. Did you know, that there are almost 1 Billion people in the world today that feel the way you do!! That is almost 1 in every 8 people now, are waking up to what really matters globally & are voicing their feelings in the most creative ways, change makers & activists, poets & artists, children & students, housewives & unemployed, scientists & doctors, engineers & designers, politicians & legislators, mothers & fathers, grandparents too… There is a global awakening equal to a GLOBAL MIND CHANGE sweeping across all of our institutions, education, health, medicine, business & even law. And this shift is happening whether we are aware of it or not, it is a paradigm change like one never experienced before, not on this scale. A truly global transformation that is taking place in every corner of the world, and not limited to a particular civilisation or country as has happened in the past, but one that is felt internally by peoples from all races, creeds & colours. One who feels it knows it. And we are feeling this in our guts, where it really matters. If you, like me, are aware of these changes that are happening, in spite of all the doom & gloom (business-as-usual), then you are a CULTURAL CREATIVE & are one of the hundreds of millions of us who are shifting our consciousness & are moving away from the outdated MATERIALISM PARADIGM WORLDVIEW that has dominated life for the last 5,000 years plus (maybe even longer? )… & are evolving towards a CONSCIOUSNESS PARADIGM WORLDVIEW… That sees all of creation, the Uni-Verse (= one song) interconnected as one great whole made out of Consciousness, the building block of creation & NOT MATTER. Consciousness before matter. All is One is All. Worldviews (or Paradigms or Zeitgeists) are tricky things you see & most of us live our entire lives without realising that we are not only living within one, but our thoughts, views & visions are shaped & trapped within them. This is the PERENNIAL WISDOM OF THE ANCIENTS. Just like fish are unaware of the water in which they swim, humans are equally not aware of the worldview into which they are born. So, You Are Not Alone! May there be Peace in our Hearts, may there be Peace in our Minds, may there be Peace in our homes, may there be peace in our communities, may there be Peace in our countries & MAY THERE BE PEACE IN OUR WORLD. The choice is ours. August 21, 2018 / MANA! I’ve only had a naked burger maybe once before, back when I was living in Los Angeles. I would say the biggest pro of a naked burger is they are about a million times lighter. What’s a naked burger exactly? It’s the same as a regular burger but with lettuce instead of a bun. What’s special about the MANA! naked burger is that the burger patty is wrapped in a swiss chard leaf. I love the taste of swiss chard. Similar to kale & known to be one of the most nutritious vegetables out there. It helps regulate your blood sugar, works as an antioxidant, & keeps your bones healthy. Also, if you’re paleo or grain-free, then the #mananakeburger is perfect for you. Don’t get me wrong, I absolutely love the MANA! gluten-friendly burger bun. Though sometimes I’m craving just the patty on its own. You can get any MANA! burger patty & make it naked. If you’re wanting a lighter meal or a snack between meals, then the naked burger is the way to go. A great to choice to add some chips & MANA!s infamous vegan dips! Last time I had it, I went for the naked burger & their hand cut potatoes tossed in zaatar with garlicnaise. The naked burger was really tasty, albeit a little bit messy to be honest. But so totally worth it. No bun no problem! July 25, 2018 / MANA! Okay, so to be honest, I used to think kombucha was all hype. I thought it was just one of those health trends that would come & go. That was until I really tried it for myself. I used to always feel lethargic & uneasy when I traveled. So I picked up a bottle of kombucha at the Los Angeles airport recently to take on the plane with me. No joke, one sip of the bubbly fermented tea & it was like magic. My discomfort was gone. The kombucha did wonders for me! So, I started drinking it regularly when I got back to Hong Kong. Bye bye upset tummy & digestive issues. 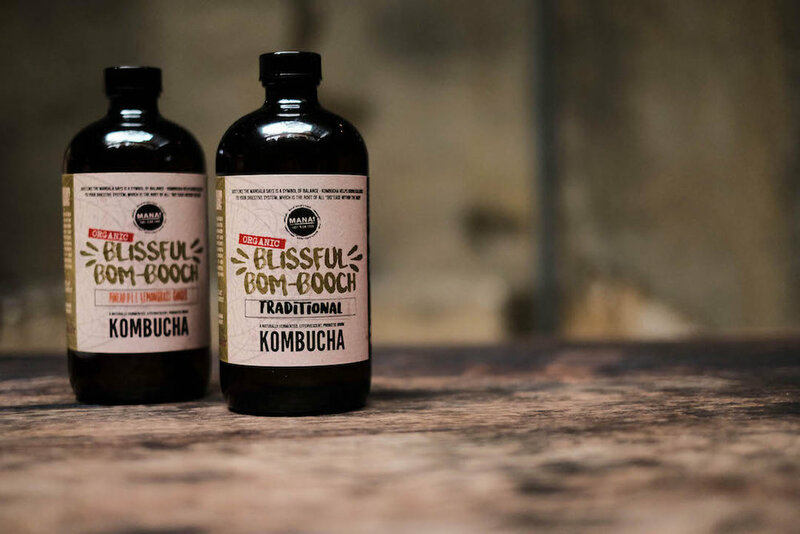 What is kombucha exactly? It’s a fermented tea full of healthy probiotics that are especially great for your gut. It helps with fatigue & headaches, strengthens your immune system, & even alleviates food allergy issues. As someone who has no shame admitting I’ve had digestive problems in the past, I swear by how amazing kombucha is. Different cultures have been consuming fermented food & drinks like kombucha for ages. It’s about time we caught on! Since I don’t drink alcohol, this is the coolest thing ever to me. There’s the Classic Original, Pineapple & Lemongrass & the Lavender Lemonade which you can only get at MANA! Café. I am secretly excited for a new flavor coming out on tap Mid - August!!! How cool would it be to be able to order kombucha on tap instead of beer at a bar? A girl can dream. At least MANA! is getting us there. July 05, 2018 / MANA! Soft, chewy, & dense, the new MANA! vegan kinda cookie is everything I’d dreamed it’d be & more. I mean, let’s be real, I’ve got the biggest sweet tooth ever. I love baking vegan desserts at home & consider myself a vegan dessert connoisseur. Having traveled all over the world in search of the best vegan desserts, I’ve tried just about every vegan sweet treat under the sun. Just ask my fiancé, who always jokes that I’m vegan just so I can eat sweets all the time (which is so not true!). But enough about me, let’s talk about this cookie. The first bite I had was just “wow”. There’s not better way to describe it than simply awesome. The ratio of cookie to chocolate chips was spot on. It’s just the right amount of sweet. 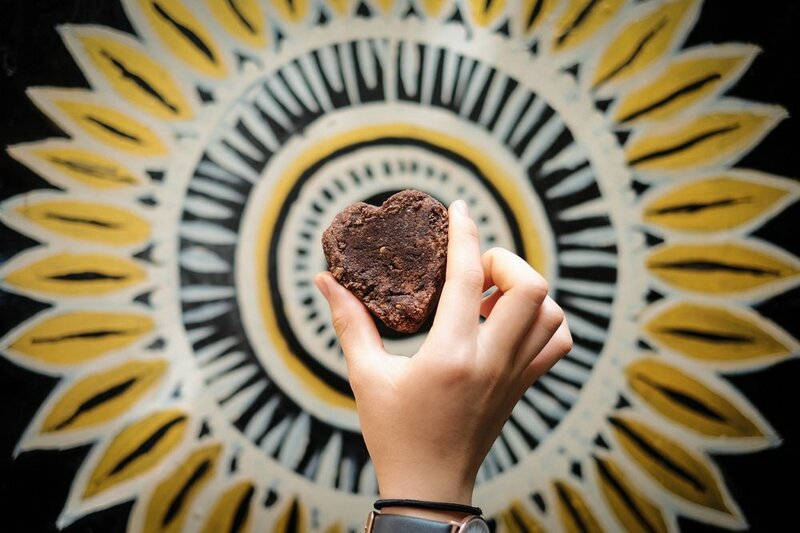 The cookie is naturally sweetened with dates & brown sugar by the way which I love. I think the soft texture really won me over. I’m a soft cookie over crunchy cookie gal for sure. And it doesn’t taste healthy at all, even though there’s no dairy or eggs in it. I swear if you ate it & nobody told you it was vegan, you wouldn’t even be able to tell! There’s a big size & a small size. But let’s just say, the #kindacookie is so yummy that even after eating the large one, I wanted to go back for more. It’s #kindabigdeal. 10:00 a.m. - 9:30 p.m.